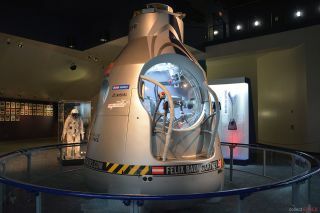 The new "Mission to the Edge of Space" exhibition at Space Center Houston features the Red Bull Stratos pressurized capsule and Felix Baumgartner's "space jump" pressure suit on display for the first time. The Red Bull Stratos pressurized capsule and spacesuit that Austrian daredevil Felix Baumgartner used to break the speed of sound while free-falling from the stratosphere last October are now on public display for the first time. The Stratos "space jump" capsule and pressure suit made its world premiere as a museum exhibit on Friday (May 3) at Space Center Houston, the privately-run, official visitor center for NASA's Johnson Space Center in Texas. While not a NASA mission, the Red Bull Stratos team included a number of the space agency's veterans, including former space shuttle flight surgeon Jonathan Clark, who served as the project's medical director. Delayed several days by weather, the supersonic feat was achieved — by coincidence — on the 65th anniversary of test pilot Chuck Yeager first breaking the speed of sound aboard the Bell X-1 rocket-powered aircraft in 1947. Austrian daredevil Felix Baumgartner jumps out of the Red Bull Stratos capsule 24 miles over New Mexico on Oct. 14, 2012. Baumgartner's so-called "jump from the edge of space" — he was nearly 40 miles (64 km) shy of the actual edge of space — broke two additional records: the highest manned balloon flight and the highest altitude jump, the latter previously set in 1960 by Air Force Colonel Joe Kittinger. Kittinger, 84, served as Baumgartner's mentor and his Capcom, or capsule communicator, at the Red Bull Stratros Mission Control. A replica of Kittinger's "Project Excelsior" unpressurized gondola is on display at the National Museum of the U.S. Air Force in Dayton, Ohio. "Joe Kittinger's gondola in 1960 was like a Model T — practical and very durable," Red Bull Stratos capsule crew chief Jon Wells said after Baumgartner's record-breaking flight. "With very sophisticated, sensitive equipment and all the 'luxuries' of cutting-edge technology, our Red Bull Stratos capsule was more like a modern supercar. From every standpoint, including a technical one, it really did its job." Space Center Houston's exhibit includes the 2,900-pound (1,315 kg) Stratos capsule, which descended under its own parachute to a "soft" landing about 55 miles (88.5 km) due east from where it was launched. Visitors can look, but not go inside the 11-foot high (3.35 m) by 8-foot wide (2.4 m) capsule to see where Baumgartner rode during the ascent and where he exited to jump. The pressure suit is the same one Baumgartner wore during the jump, one of only three that were produced. It was built by the David Clark Company, the same manufacturer which also made Kittinger's historic pressure suit and the spacesuits worn by NASA's Gemini astronauts. David Clark also produced the pressure suits worn aboard the SR-71 "Blackbird" and U-2 high altitude jets, as well as the launch and entry suits used by the astronauts on the space shuttle. Guests touring the "Mission to the Edge of Space" exhibit can learn more about Baumgartner and his dive through a series of display panels, including audio listening stations equipped with iPads and video screens that surround the capsule. "Jump into an incredible behind-the-scenes exhibition revealing the passion, physics and scientific significance of this unprecedented event," Space Center Houston said on its website. "Red Bull Stratos is part of Space Center Houston's ongoing mission to inspire students to consider careers in the fields of math and science." Click through to collectSPACE.com to see more photos from Space Center Houston’s “Mission to the Edge of Space” Red Bull Stratos exhibit.